It's been a crazy, hectic very rainy summer....having a blast with our two dogs, and having adventures when we can, which they love. I just have an issue with Kitchee, our 8 month old- and barking. Wyot was not a barker at all. As a matter of fact, we didn't hear his "voice" until he was almost a year old! 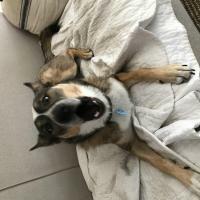 Whining is one thing, and that was his problem, but now that has abated, and his bark is a big, throaty loud bark, when it is warranted (phone ringing, danger, someone coming to the door for instances). Kitchee on the other hand, barks at EVERYTHING. It is also a very high pitched bark, almost like a chihuahua! It is cute, but not when he does it all day for whatever! The biggest problem is mornings...he hears EVERY sound in the house...he knows when it starts getting light out, and if he hears our bed creaking as we turn in our sleep, he starts the barking. And...it doesn't stop. I go downstairs (usually 5:30 am- improvement, as it used to be 4:30!!! )...I take him out, and he does his business, and comes back in, but he is in super HYPER mode. Wyot is still hanging out, and is in low mode. He always stayed quiet until we came downstairs, and then he would be happy to see us and showed his appreciation at us joining him (LOL!, yes, him) by wagging his tail crazily, and leaning on us, waiting to be petted. Kitchee comes flying out of his crate (which he loves and sleeps in a full night, and goes into during the day by himself) like a maniac dog, and is very barky, very vocal, and attacking Wyot by jumping, biting, pulling, etc....I try to calm him, but he runs circles like a Tasmanian devil, while Wyot patiently takes his nips and yaps. I attempt to go upstairs to sleep a bit more while letting him loose in the gated off territory of the kitchen and entry, but he won't have it, and BARKS and BARKS until I tell him to be quiet...and he is, for less than five minutes!!! I have tried to give tough love, and have always been successful, but NOT with him. He does not care. He just BARKS at everything!!!!!! One day, hubby lost it and just. came downstairs (not ideal, but it does get on your nerves after a while), and shouted SHUTUP!!! !....and it seemed to work! Now, it seems, every time he starts to bark, the "shutup" word said sternly with a look works. Longer than before, but he eventually goes back to that if he wants attention. He is also jealous of Wyot, where I cannot even pet him, without Kitchee flying at Wyot and trying to push him away, with (playful) growling and nipping. I ignore him, and push him gently but firmly away, and say it's Wyot's turn...sit and wait....which he eventually does, but then goes right back to it. He is ONE STUBBORN pup! Extremely smart in many other ways, a good car traveler, amazing frisbee player, and getting pretty good at recall when out in the field. I guess I have to keep up the tough love, but when you are sleeping and are awakened by constant barking that won't stop (and I mean for two hours or more!!! ), I am at a loss and looking to this wonderful community to help me figure something out, or see something I don't see. Thanks in advance for all your advice! Zuni and i will be very interested to hear the wise answers to this question....He too really seems to love the sound of his voice and has an opinion about many things.....we will be waiting ....He loves to wake me up in the am( if i have slept too long in his opinion ) ----letting me know the cat is at the door, the garbage man is here, etc. Edited by NorCal, 21 August 2018 - 02:19 PM. This needs to be corrected early as the longer it goes on the more difficult it could be to resolve later. I LOVE the penny bottle. It has works well for me, and I do believe for others on the forum as well. I learned this technique years ago and have used it with good success. I even watched a television show several months back titled "Lucky Dog" where the trainer used a penny bottle to teach the off command to the dog in training. A kennel out here, which trains dogs for therapy dog training, uses pots and pans to stop dogs from barking. The idea here is to use anything to distract the dog from what is causing the barking, followed up by a stern "NO BARKING". It is probably best to work on this during the day instead of in the middle of the night. Fix it during the day and hopefully the "No Barking" command will be all that is needed at night. The trick here, as with all training, is do not give a command unless you are willing to enforce it. In other words, if you tell the dog "sit" and he/she ignores the command, you must enforce the "sit" command by making him/her perform that command. I use a technique I call ask, tell, make. We don't always want to be loud and forceful when giving a command to our pups. So I give a calm command (Ask) and expect my pup to obey, if not, I give the command in a firm manner (Tell) so there is no mistake that I mean what I say. If my pup still does not obey, I get up and (make) my pup execute the command I gave. Greg, thank you for your insight! I am grateful that it is not the middle of the night, it is just too early in the morning at 5:30....the last two days I have taken him out, then do the usual routine of telling him "sleep"- "crate", and give him 3 tiny nuggets of food as treats, but wrap it in his blanket, so it is a puzzle (this is the way he knows it is bedtime, since I don't do it at any other time, except if we are going out and he needs to be crated for a few hours).....and then I go where he can't see me, in the living room, on the couch to rest. I hear him protest a little after the treats are found. A squeak here...then there....then one bark- and I say quiet- gently but with authority. He settles. All is quiet. Wyot just knows and goes back to his curled up spot in the living room where he sleeps every night. Yesterday morning it took 5 "Quiet" commands...today, it took only two! This way I can hear how he starts winding up, and if he starts....and he knows I am the alpha, and he doesn't get out of the crate until I say so. Edited by KittynDoc, 22 August 2018 - 02:51 AM. Penny jar and 2 cents. I laughed at that one..
Just going to echo Greg's observation that this needs to be nipped and can also be one of the harder ones. I think you may have multiple triggers. Sometimes it's look look attention, sometimes it's anxiety, sometimes guarding. Is he fixed? How old now? Drives come in along a time line of maturity from testicle drop to about 18 months. (ps our vet is now recommending not to neuter until 18 months so the dog gets the growth advantages of hormones). I do think Indian Dogs are more malleable even as older dogs to changing behavior, which a double edged sword. We had a GSD with bark-a-reah. He was vocally incontinent in the car and at the vet. Triggers included the car, the car moving, getting close to home, getting close to a favorite hike and quadrupeds out the window of the car and the vet. At the vet it was anxiety. He had a permanent note in his chart saying HUG STAT. That tended to fix it - but it had to be of the attending technician once in "the room". Point #1 the fix might be really specific for any single bark trigger. The car thing we were unable to resolve. It got better, it went away, it came back and so on. We put ear plugs in the glove compartment. Waki was able to correct Shiva in the car and that kept the barking to short eruptions. Point 2 you might have to correct like a dog or let Wyot correct if he is so inclined. At the moment we have Fenris the GSD who is very specifically barking at thunderstorms, only at home (we had him out to the trainers to work on thunder/fireworks/ guns since October hunting noises are incessant here). No barking, none what so ever, he couldn't care less. Trainer observes zero issues. Home - thunderstorm - conversation with thunderstorm. We think he is "protecting" Waki who is afraid of thunder. So we are working with training treats. Point 3 the behavior trigger can be "complicated". On the plus side, Waki came out from under the pillows and seemed to be braver this last thunderstorm. They're emotional, complicated little beings. Sigh. Yeah, we too wait until maturity, after 18 months for the growth advantages as well! Personally, Kitchee has been VERY vocal from day one. Wyot was not. I was hoping he might have outgrown the barking to be let out of his crate, but his pattern has not changed. It is I who needs to be the alpha, and let him know I will let him out (reasonably, obviously, letting him out to do his business after being in there for sleep) when I deem to do so, not when HE thinks he should! I had experimented with letting him loose in the kitchen area that both dogs are in all day with me, but he barks almost worse and won't let me go back to sleep. SO, back into the crate, and hence the training I am trying in the morning. I am hoping he will "get" it. Sherab, my Wyot does the insane bark-talk-howl when he gets excited as we approach a place he knows adventure awaits, or he sees me take out the harnesses, meaning it's time for them to go out tothe car on an adventure...Kitchee tries to follow in the howls, but is unsure as he just circles excitedly, because he never really hears Wyot bark or vocalize too much, and lets him. I am finding clapping is working like the pennies, if I don't have anything at hand. Saying the word (sorry) shut up emphatically, but gently is working...so, persistence and patience, I guess. He is an attention hog, and pushes Wyot out of the way for everything, which I do not allow., but he is a pushy one, LOL! Wyot is a good older brother, and he lets Kitchee have his way- though once he has had enough, he does let him know. Edited by KittynDoc, 22 August 2018 - 08:50 AM. The first time we went to Song Dog Kennels to meet Kim and look at the dogs 5 years ago, we got out of the car and walked toward the dogs where Kim was. Many of them started barking. Kim immediately said "No Barking" in a firm voice and all the barking stopped immediately. I'll never forget that. I used that command for training Ayita. She really doesn't bark that much unless we're being attacked by the UPS truck or squirrels, but she stops as soon as I look at her. Although sometimes she can't resist a last bark or so after I turn away. Ayita gets the last word, eh? LOL! I do hope to get to that point. It is getting a tad better...although, today, he was up and barking at 4:30 am.... I decided I'd leash him, and take him out the front door, no lights, and let him do his business.....I said "sleep" as soon as we came back in, and he went in the crate as per usual. Then...a minute or so later, the protest squeaks, that turn into barks. I lay on the couch (where he can't see me)...and out comes my command- QUIET. He settles. I try to sleep on the couch, Wyot sleeps in his spot again....and 15 minutes later, the squawks start. Again...QUIET. He settles. Today I only had to say that twice, and I did not get up for the morning until 6 am, and ONLY when he was quiet. Then, the slider door shades opened, and I wouldn't let either one of them out until they settled and sat down. I aspire to Kim's ability to stop the barking like that! I believe Khya is Kitchee's sister. Same barking / back-talk issue. Sometimes it is just so funny but other times - OMG. The sounds that comes out of her! Yaps, yips like a coyote. Howls that would do a northern wolf proud. Throaty chewabacca gurgles. Cujo growls. Sings & whistles like a canary. She goes to get her leash, wraps it around her back and brings it up the stairs. Has calmed down in the car although did manage to lock us out when we were up north. OMG...yes, the high pitched bird/canary like chirps, yip, yap and isn't that a right on description -"throaty Chewbacca gurgles"!! He is SO SO vocal, and we are working on dialing it down. Believe it or not, if the two of them bark -(very rare that Wyot chimes in, unless the phone is ringing, or people are passing by the house and he sees out the window)-when I say NO BARKING very emphatically, the chorus ceases!!!! Hmmmm...maybe they both remember Kim saying this to the dogs at the Kennel, and somehow reached deep into their subconsciousness , LOL! But glad that is working now. PS- Really funny about Khya getting her leash to bring to you!!! Edited by KittynDoc, 03 September 2018 - 03:46 AM. I might get backlash for this, but I used a bark collar for Nakoma when he was a puppy because of his barking. After a few days, no more unwanted barking. And haven't used the bark collar since. He's three years old now. He only now barks when he is playing with his dog friends, or if there are Intruders on our property. Other than that and his adorable Chewbacca sounds when communicating or playing with us, he is a quiet boy, and allows me to sleep in until 5:15. ".I'm sure he will grow out of this, but I feel bad for. Wyot, because he has winced on many occasions as Kitchee literally jumps at him and pushes him out of the way if he sees him going towards any one of us..."
Zuni does this too if the cat trys to sit on a lap.... they keep you on your toes for sure! Edited by NorCal, 12 April 2019 - 11:56 AM. I recently started using an electronic dog whistle I got on Amazon, and it's worked very well. I just use the command Quit. Frankie has also been a "hear's everything" dog, but now she just grumbles at the garbage truck and other offenders. (Which cracks me up, so I have to work not to laugh:) She's also generally way more responsive to my voice and other commands. I only had to use it steadily for a few days, and now it's just occasionally. She still does a great job barking when someone actually comes to my door, and stops when I come to investigate. I've rewarded her heartily for that, as I do the when she refrains from barking unnecessarily. Kaposia really never barked excessively until we went to the obedience class. Seems she found her voice there around the other dogs. She always did some bossy barking, but after the classes it picked up....intensity and endurance.